A gourmet dinner, a spa visit, flowers, a King Size shrimp sandwich, wine tasting or a relaxing hotel stay. You can spend your gift card on whatever you like. The gift card is valid throughout Gothia Towers and Upper House. A shipping and handling fee of 19 SEK per gift card is added to your order. Your order will be sent the following working day. Please note that we only ship orders to countries within Europe. Surprise someone with a Gothia Towers gift card! Our gift cards can be spent on anything. A gourmet dinner, a spa visit, flowers, a King Size shrimp sandwich, wine tasting or a relaxing hotel stay. Add your chosen amount, and let the recipient decide. It’s the ideal gift for any occasion, or simply to show your appreciation! 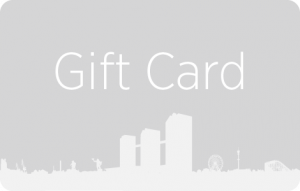 Gothia Towers works with a third party, Goyada, in connection with gift card sales. If you have any questions about our gift cards, please contact Cashcom/Goyada’s support team in the first instance, and they will help you. What happens if I have lost my gift card? Gift cards are a valuable document and are not issued to a specific person. They should therefore be treated like cash, and lost gift cards cannot be blocked or replaced. Gift cards are valid for two year. My card has been demagnetised. What should I do? Is VAT payable on gift cards? No, gift cards are VAT-free.